It is becoming increasingly recognized that the cloud forests of tropical mountains are high on the list of the world’s most threatened ecosystems. In many countries or regions, their rate of loss exceeds that of the lowland tropical rain forests that have received much public concern. 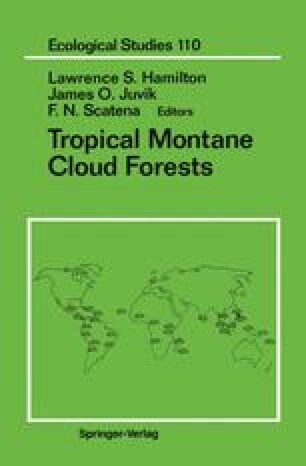 Perhaps 90 percent of these tropical montane cloud forests (TMCFs) in the northern Andes have been lost. During the symposium, for which this publication is the proceedings, visual evidence presented by Dr. Alwyn Gentry and others, and the verbal descriptions given by many participants, attested to the loss not only for the Andes, but for all parts of the world where TMCF occurs. The original estimate (and it was only an estimate) given by Persson (1974) of 50 million ha of cloud forests was probably on the high side. He suggested that TMCF constituted one-quarter of montane and submontane rain forest. We believe that TMCF is being lost at a rate considerably in excess of that of the much-abused, but much-publicized, lowland tropical rain forest. Indeed the first paper (Doumenge et al.) that follows indicates that annual forest loss in tropical hills and mountains is 1.1 percent compared with 0.8 percent for all forests of the tropics. Those on isolated volcanic mountains, especially where occurring on small oceanic islands, are particularly vulnerable, and their loss is a serious concern. Cutting of forest for firewood or for charcoal production, and conversion to agricultural uses (mainly grazing) are the principal villains. However, the threats and damaging activities are many. They will be discussed in this synthesis and in many of the papers that follow.